Death A La Mode is Here! The second book in the Recipe for Death series is here! Jackie’s still adjusting to having a steady boyfriend—not to mention getting used to the fact that Lucas is a death broker/vampire. With the help of his ex-lover Cathryn—whom Jackie doesn’t quite trust—they’re trying to figure out why Lucas was turned—and by whom. Jackie’s biggest challenge at the moment, though, is creating a winning entry to the annual Perfect Pecan Pie Festival, the premiere food contest in Palm Dunes, Florida. Testing recipes and running her new restaurant are keeping her busy. But no one’s too busy for murder. When people around local up-and-coming folk singer Crissy Darwin begin turning up dead, Lucas is pulled into the investigation. He and Jackie suspect that Crissy herself is the target. But can they solve the mystery before the killer strikes again—and without ruining the Festival? Pour yourself a nice glass of Lambrusco, cut a slice of pie and settle in to see what happens. 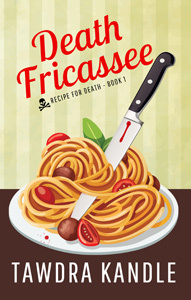 And Book 1, Death Fricassee is on sale for only 99 cents! ALWAYS OUR LOVE Release Day!